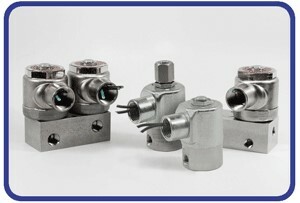 Peter Paul high pressure valves operate with a pressure between 1000 and 3000 PSI. Medical, Laboratory, Instrumentation and Industrial companies, etc. that require high pressure bottled gas with media such as 02, C02 and compressed Nitrogen use our valve in various applications. Peter Paul single orifice valves in which the orifice is closed in the energized position and no flow can exist between the inlet and outlet ports.